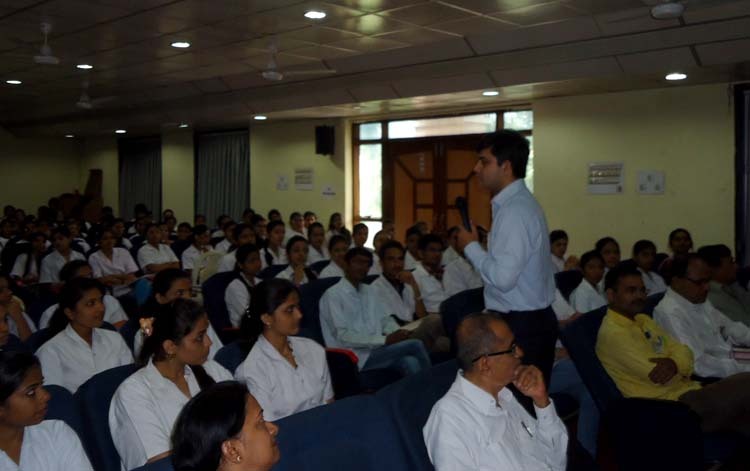 VYRA.SEP.4: The C. N. Kothari Homoeopathic Medical College & Research Centre in association with Homeopathic Medical Association of India, Vyara Unit has organized a one day seminar with Dr. Rishi Vyas, Other song Academy, Mumbai for the 3rd & 4th year BHMS students. Dr. Mrs. Jyoti R Rao, Principal welcomed the gathering. Dr. Kanubhai Desai, President of trust was present on the occasion. Dr. Rishi spoke about understanding of Drug picture from different books based on grouping, symptoms, physiological action, sphere of action etc. He further pointed out the real difficulty faced by beginners in identifying same Belladonna fever clinically, which he knew thoroughly as a student of materia medica. To overcome this difficulty Dr. Rishi presented five cases of different remedies like Cantharis, Tarantula, Phos, Silica, Stramonium with its symptoms, concomitants, sphere of action, modality & most significant part of learning pattern of each remedy presentation. The event was anchored by Miss Evengeli Gamit. Dr. Heema Pandya ended the event with vote of thanks.